Poltergeist. 2015. Directed by Gil Kenan. Written by David Lindsay-Abaire, based on the original 1982 screenplay by Michael Grais, Steven Spielberg, and Mark Victor. Starring Sam Rockwell, Rosemarie DeWitt, Saxon Sharbino, Kyle Catlett, Kennedi Clements, Jared Harris, Jane Adams, and Susan Heyward. ★★ Unfortunately the latest remake to hit the windshield, Poltergeist, does nothing whatsoever to buck the trend of terrible remakes. It’s not that the movie has a bunch of shots with booms in them, or that the technical side of things wasn’t handled correctly – there are enough effects and things of that nature to keep people entertained. 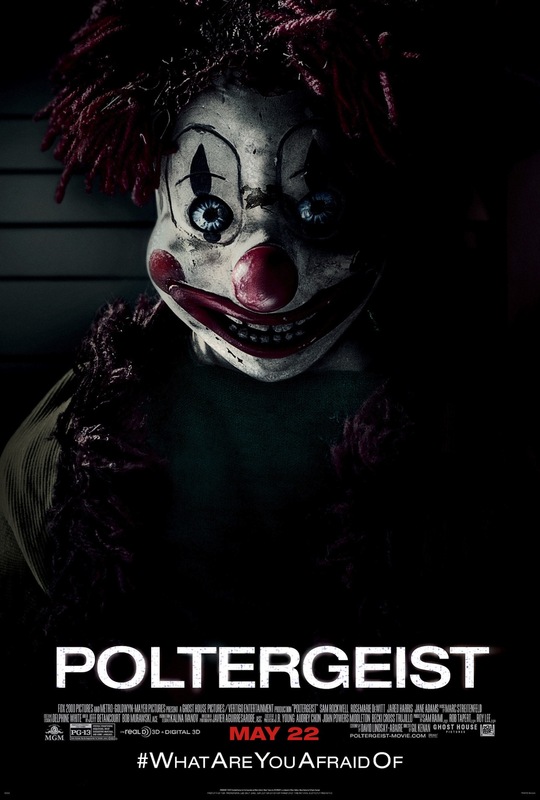 My problem with this movie in particular is the way in which it’s being presented, as if this new iteration of Poltergeist is in some way a “reimagining” and that the story has been made contemporary, other than the fact it has cellphones and new technology in it. I mean, sure, that represents the contemporary gadgets we have now in society, but in no way has the theme overly changed. Sorry, I don’t buy that. I really do love Sam Rockwell, he’s just not used correctly here because this is one of those generic parts that doesn’t really required anybody above and beyond. Rockwell is great, but he is wasted on a less than mediocre film. I’ve loved his performances in a lot of films, definitely a personal favourite of mine – A Single Shot, Moon, Choke, The Assassination of Jesse James by the Coward Robert Ford, Joshua, Confessions of a Dangerous Mind, The Green Mile, Lawn Dogs, and his earliest film Clownhouse – but this is not one of his greatest. Not because he’s bad; he isn’t, not at all. There’s just nothing for him to do here. He gets to freak out, hit a few things, he worries for his daughter, his family. There’s just nothing spectacular in the way of dialogue or action that impresses me about this remake. Because the first time around things were great, and there’s no need to tread through here unless something different will come of it. However, Gil Kenan only gives us a bunch of special effects, a few lingering things in the dark, but nothing concretely new, nothing truly scary. The original Poltergeist gave me the creeps – this one, not so much. Not at all, really. One thing I must say, I do like the young Kyle Catlett who I’d first seen on The Following (the Kevin Bacon-James Purefoy show I love and many hate). He is an excellent talent, very awesome child actor who I hope continues on to more mature roles as he ages because he is highly expressive, has good energy in front of the camera. Too bad this movie doesn’t give much to carry, otherwise this might’ve been an even better career launcher for him. I suppose he isn’t doing bad as it is; the movie does star Rockwell, it is a remake of a huge horror film from Spielberg, Tobe Hooper, and other big names. Still, I wish this was a better movie for his sake. Basically my philosophy for horror is this – even if a story is not that great, if the effects and the way things play out by the end of the plot are done well, if the scares are there or if I’m downright terrified, I can forget some of the lesser parts of film. But if a movie has the bare minimum of any of this, there’s not much I can really take away. The big “they’re here” moment here is just a big SIGH compared to the original. Catlett tries to sell things as well as he can, for his part. Other than that, I was underwhelmed. Constantly. There just was not one real redeeming quality as far as the horror goes throughout the movie’s runtime. The effects that were present were all, of course, tame because the movie is PG-13. Yet aside from that, a movie can still be scary regardless if it’s R or otherwise. Poltergeist cannot satisfy the horror hound in my soul, I doubt it will do so for very many especially those well-initiated in the genre. I’ll give the Poltergeist remake a 2 out of 5 stars, and I’m not sure if that’s honest or if I’m simply being generous. Often I try not to trash a movie outright, however, I’m truly sick and tired of subpar remakes. In my opinion, there are only a few remakes worth the time of day – The Hills Have Eyes, Halloween, and not many more, even those will be contested by people reading this – and this newest version of a classic film in the genre does nothing to change any of that. I think the 2 stars I’m willing to dish out is simply because Rockwell did his best with what was given to him, as did Catlett and even Rosemarie DeWitt and Saxon Sharbino, but nothing can overcome the fact this is yet another attempt to cash in on the trend of remaking, rehashing, repacking and reformatting of old hits. There are some – such as The Hills Have Eyes particularly – remakes which benefit from an update, solely due to budget constraints and things of that nature that plagued the original productions and genuinely were of concern to the ultimate product. That being said, a lot of the remakes are cash grabs. We all know it, they know it. Stay away from this one. The 2 stars is, on second thought, too generous. But I’ll stick with it. Check elsewhere if you want a compelling, actually scary ghost story. Probably pop in your DVD or Bluray of the original Poltergeist sometime soon – I know I will be.